QFF Energy Savers has compiled a detailed breakdown of information and resources on reducing your on-farm energy consumption. Farmers and irrigators should regularly check their tariffs to make sure they are on the most suitable tariff. Audits undertaken during the Energy Savers program throughout Queensland have identified opportunities for farmers to save money by reviewing their tariffs: case studies highlighting tariff opportunities are available HERE. The Drought Relief from Electricity Charges Scheme provides relief from supply charges on electricity accounts that are used to pump water for farm or irrigation purposes. Details and application at the Department of Energy and Water Supply website. 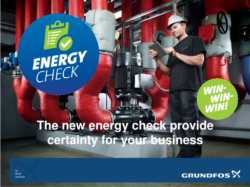 Download checklists and energy efficiency guides to help reduce energy consumption. Ross Anderson from Aqua Gold Consulting explained how Ergon Tariffs work at the QFF Cotton Irrigators Field Day on 7 September. See the presentation here. The owner of the electricity distribution network, or Distribution Network Service Provider (DNSP) in Queensland is Energy Queensland, which has recently been formed by the amalgamation of Ergon Energy and Energex. Use Ergon’s Incentive Search (search by map, address or NMI) to see if you are in an area where there are cashback incentives for reducing demand or improving power factor. Find out more about power factor and how you may be able to make energy and cost savings with power factor correction (PFC) at the Ergon and Energex websites. With Irrigation making up a large proportion of on-farm energy for many sectors, there are often significant opportunities to save energy with improved irrigation systems. Moving water around is energy-intensive so by saving water, farmers can also save energy. Many agricultural sectors have worked over recent years on Rural Water Use Efficiency Projects. The Energy Savers Programs have audited a number of irrigation systems and identified a number of energy efficiency savings. 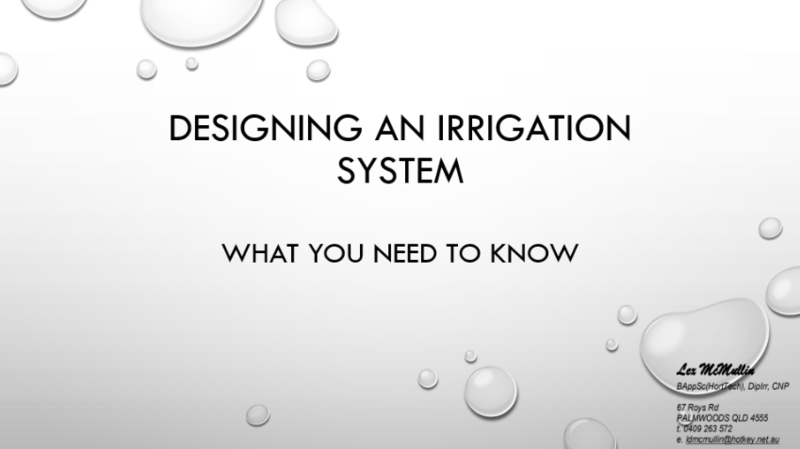 See the Irrigation Case Studies HERE. Needs analysis, design and planning to balance water and energy efficiency objectives to deliver the right amount of water at the right time. Optomising equipment, so that the system delivers the best result for the energy inputs. Energy source – using the most cost effective and efficient energy source. 5% of the lifetime cost of a pump is the purchase price, and 85% is the energy cost! Increasing poly pipe diameter from 32mm to 50mm (over 200m at 2l/s) will cut pumping costs per ML by around 90%! Limiting water velocities to 2 metres per second. Pat Daley advised growers about Powering irrigation with Solar PV, including understanding irrigation system design and managed system capacity to get the most out of your solar PV. See the presentation from the September 2016 Irrigators Field Day in Cecil Plains. replacing a pump on a centre pivot, with a payback period of 0.19 years. 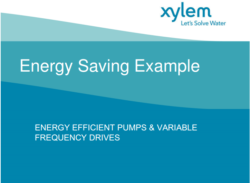 See a Xyl em Pumps worked example from the QFF and Ergon Energy Savers 2015 Roadshow showing the potential energy savings in upgrading a pump and motor to a high-efficiency model, and then further savings by adding a Variable Speed Drive (VSD) to pump the same amount of water over a longer period. a 90kW moveable pump with a discharge valve targeting 170psi running 985 hours per year, getting a payback of 3 years. Good design of farm buildings can lead to energy savings. Buildings that are designed to allow natural light access, without allowing the heat; and allow prevailing breezes to cool the building; will save on lighting and ventilation costs – and be more comfortable to work in! See the AgInnovators information on Energy-efficient farm buildings. 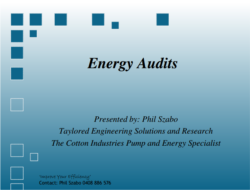 Some advice is provided on the Ergon Energy Website about Energy Audits and Choosing an energy efficiency consultant. Ergon’s Trade Ally Network lists providers of a range of products and services including energy auditors and consultants, refrigeration, financial and irrigation businesses. Some more information is provided about skills requirements for Energy Efficiency at the Australian Government’s Energy Efficiency Exchange. There are many ways you can reduce farm fuel costs, and many are quick-wins, which mean they won’t cost anything to start with, and will save fuel immediately. There are good fuel cost savings to be made by adjusting your driving technique. Fast acceleration and hard braking, as well as carrying extra weight can all contribute to higher fuel consumption compared to more moderate driving. The RACQ provides advise on driving to cut fuel costs through ecodriving, with 11 simple tips. There are a number of useful fact sheets with good tips on saving money through eco-driving. The ecoBiz Fact Sheet: Efficient Driving and Fleet Management provides advice on choosing vehicles and driving to save energy. See also the AgInnovators page on Adaptive driving – the skill factor in fuel efficiency. It’s easier to save on fuel costs when you have the right-sized tractors and machinery. Consider estimating your tractor power needs and choosing the most suitable size, rather than buying the highest horsepower-per-dollar model. The AgInnovators website includes fact sheets and a guide on Estimating Tractor Power Needs with an 8 step assessment to help choose the most suitable tractor for the job. Light Vehicles: Cars, utes and vans. The Green Vehicle Guide – helps you by rating new Australian vehicles based on greenhouse and air pollution emissions. Small – Medium Trucks and Commercial Vehicles. Truck Buyers Guide – provides tips and guidance on selecting fuel efficient trucks. Energy Productivity is the gross value of products delivered for every unit of energy. It measures the amount of product that can be produced per unit of energy. Increasing or improving energy productivity means to reduce the amount of energy required to produce each unit of output. See the Aginnovators renewable energy information here, including descriptions of the key renewable energy sources. Once you’ve identified energy savings or renewable energy opportunities for your farm, the next challenge is to find the funds or finance to make it happen. There are a number of options to either reduce up-front costs or reduce the borrowing costs for the project. These can include new efficient pumps, motors, compressors, vehicles, lights, renewable energy systems and many other products. Please see the Energy Savers Fact Sheet for details on finance and funding for energy efficiency and renewable energy initiatives. View fact sheet HERE. Each of these financing structures have advantages and disadvantages. The choice of product depends on the farm’s specific requirements. Energy efficiency loans are becoming more widely available in the marketplace. These loan products are tailored to overcoming barriers to energy efficiency implementation. In practice these loans are similar to equipment financing with preferable rates or longer loan periods. Lower interest rates are available for energy efficiency and renewable energy projects through low interest loans provided through The Clean Energy Finance Corporation’s (CEFC) Co-Financing Partnerships. Discounts of up to 0.7% off equipment finance rates plus longer terms are available, with security generally on the equipment. These are available through the National Australia Bank, Commonwealth Bank and Westpac. QRAA, a Queensland Government Agency, offers a “Sustainability Loan” of up to $1.3M to assist with productivity and efficiency projects. Low interest rates and fixed rates (currently as low as 3.11%) are available and they may work with your bank to co-fund a project. More details on Energy Efficiency Loans are provided in the Energy Savers Fact Sheet. The Energy Services Agreement model or “Turnkey Solution” is where an Energy Services Company designs, installs and finances the project. In this case, you may not have any upfront costs and repay the cost of the project out of energy cost savings. In some cases, the project may be cash-flow positive from day 1. More details on Energy Services Agreements are provided in the Energy Savers Fact Sheet. The Energy Savers Fact Sheet’s Quick Reference Guide compares a number of options available to reduce borrowing costs for efficiency and renewable energy equipment. A Solar PPA is a financial mechanism where a provider installs, owns and operates a solar photovoltaic (PV) system on your property, selling you electricity generated on site at an agreed tariff, and agreed escalation rate. A number of companies are now offering Solar PPAs. For Details of the programs above, please refer to the Energy Savers Financing Energy Efficiency and Renewable Energy Fact Sheet. Solar Photovoltaic (PV) Systems and other renewable energy technologies may be eligible for Renewable Energy Certificates under the Renewable Energy Target (RET). For Solar PV systems up to 100kW a Small-scale Technology Certificates (STC) is credited (deemed) for each megawatt hour MWh the system is expected to generate until the end of the program in 2030. The value of the STCs will be deducted from the purchase price of your system by your supplier, reducing the purchase price of the system. In 2017, the deeming period reduced to 14 years, and will now reduce by a year on 1 January each year, slightly reducing the system discount. STCs are also credited for solar or heat pump hot water systems, wind turbines up to 10kW and small-scale hydro plants up to 6.4kW capacity. Larger renewable energy systems of over 100kW create a Large Scale Generation Certificate (LGC) for each MWh of renewable energy once it has been generated. LGCs are then sold or traded at a negotiated price, usually to retailers or other businesses that have an LGC liability through an open LGC market. The price of LGCs fluctuates based on supply and demand and the income from LGCs occurs after the energy has been generated. It will therefore not reduce the purchase price of the system, but provide a revenue stream. Want to keep a copy or print the fact sheet? Solar PV uses panels to convert radiation from the sun into electricity. How much Solar PV should I install? Systems that are too large will generate excess power that may not be able to be exported to the grid (depending on location), or export at lower feed-in-tariff rates. a Solar PV assessment tool for chicken farmers prepared by the RIRDC. CottonInfo has prepared an analysis of opportunities for grid connected solar for irrigation, including analysis of a 87MWh per year system at Gunnedah and a 595MWh per year system at Wee Waa. 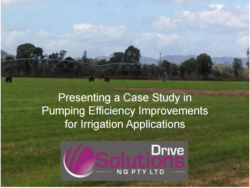 See a case study video of a Narromine cotton farm with a 100kW Solar PV and diesel generator powering a 55kW submersible pump with variable speed drive. There is a pdf version of the case study available too. A Gunnadah cotton farmer has used Solar Photovoltaic Power and variable speed drives to cut energy costs and water consumption. 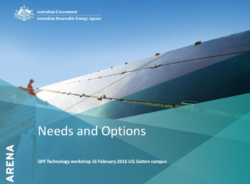 Refer also to the NSW Farmers Solar Powered Pumping in Agriculture: A guide to System Selection and Design. The Queensland Governments, MinesOnlineMaps website includes Renewable Resources maps which show the average solar insolation throughout Queensland along with suitable infrastructure. Wind energy is harnessed when wind drives the rotation of the blades of a wind turbine, turning a generator to produce electricity. Wind energy has a long history with agriculture in Australia, with many farmers using windmills to pump bore water. Modern wind turbines range in size from small turbines that can produce a small amount of power for houses, boats and caravans, to large grid-connected turbines of over 2 megawatts capacity. Wind power is generated when the wind blows, and is therefore considered a ‘variable’ source of energy and will be well suited to combining with energy storage to match generation with use. The potential to export power to the grid. The Queensland Governments, MinesOnlineMaps website includes Renewable Resources maps which show the average annual wind speeds wind roses throughout Queensland along with suitable infrastructure. Ground-sourced heat pumps transfer heat between the building and the ground, and make use of fairly constant year round sub-surface temperatures – typically between 10 and 15 degrees celcius. They are well suited to heating and cooling applications. This constant ground temperature means that the temperature difference between the condenser and evaporator can be reduced, requiring less energy. For example, on a hot day of 40°C where a conventional system will need to provide a temperature difference of 16 degrees to get a target temperature of 24°C, a ground source heat pump will only need to provide a difference of 9°C. The installation of ground-sourced heat pumps can be more expensive as the technology requires heat transfer pipes to be buried deep in the ground for the heat exchange to occur. Solar Thermal Heat is where the sun’s energy is harnessed to provide heat which can be used directly or used to drive a turbine to generate electricity. The most common application of solar thermal heat in Queensland is the use of solar hot water systems to heat water for homes, pools and businesses. Power Tower: where light is reflected from thousands of ground-mounted mirrors to a collector at the top of a tall tower, generating very high temperatures and pressures. Parabolic Trough: where long mirrors, or highly polished metal troughs reflect sunlight to a solar collector at its focal line. The troughs can be six metres in diameter and hundreds of metres long. Solar thermal heat requires direct sunlight to generate high heat. As such, they are a ‘variable’ technology and extensive research and development is underway to develop cost-effective thermal storage solutions, such as molten salts to enable energy to be generated outside daylight hours. 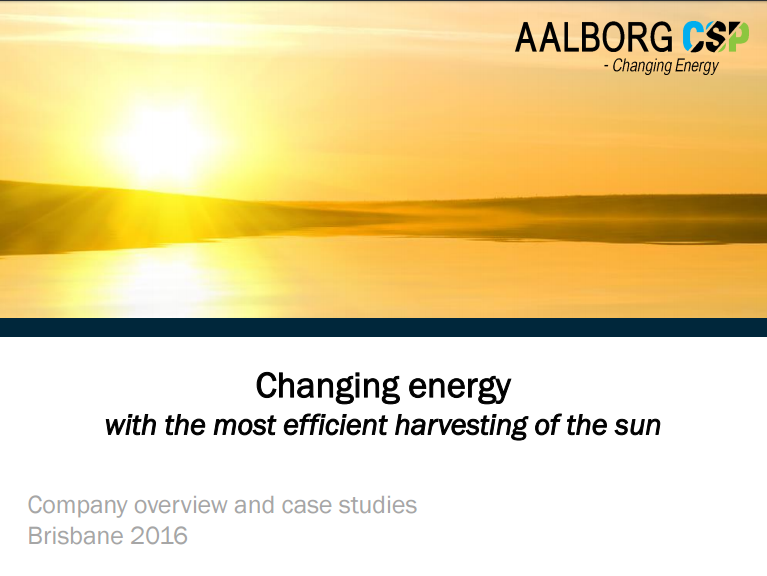 CSP Aarlborg presented an outline of the Sundrop Farms project in South Australia, including how their solar thermal Power Tower technology will be used to provide electricity, steam and desalination to produce irrigation water for the site. Also presented were smaller, scalable solar thermal and solar hot water technologies. Full presentation HERE. The Queensland Governments, MinesOnlineMaps website includes Renewable Resources maps which show the average solar insolation including Direct Normal Irradiance (DNI) throughout Queensland along with suitable infrastructure. use of an absorption chiller to generate electricity, heat and cool in a process called trigeneration. Utilitas outlined their technology to harness biogas, including a 200kWe Queensland case study, a 1.2MWe project in development and sought interest from farmers for a utility-scale plant in the Lockyer Valley. Full presentation HERE. Qantum presented their biogas technology including an egg farm and abbattoir case study, including the potential to use biogas to manage peak demand, and its potential to combine with solar power and batteries for greater efficiencies and demand management. Full presentation HERE. The Energy Savers Plus Extension Program is delivered in by the Queensland Farmers Federation with support and funding from the Queensland Government. Join the Energy Savers community by staying up to date with the latest technologies, resources and tips on how to improve your farm business. 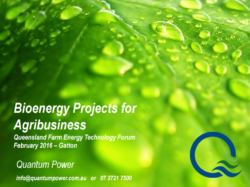 Subscribe to the QFF Energy Savers e-news for the latest information, events and case studies that will benefit your farm business.